About once a month, my coworkers get together for “Craft Night”. Each girl takes a turn hosting and all from the office are invited. We’ll sometimes work on a joint craft like glitter pumpkins, or sometimes we’ll bring individual projects to make. Wine and cheese are necessities. This month, we chose to test our hands (literally) at arm knitting. The inspiration came from Vickie Howell’s project. The week leading up to Craft Night, Pinterest links were shared and talks of yarn combinations took place on the way to (and sometimes during) meetings. Arm knitting is relatively new to the craft world and pretty simple to pick up. It’s gained popularity through its instant gratification and short supply list – all you need are your hands and some yarn. The craft uses similar principles as ‘real knitting’, so those familiar with needles will have an easy time grasping the concept. 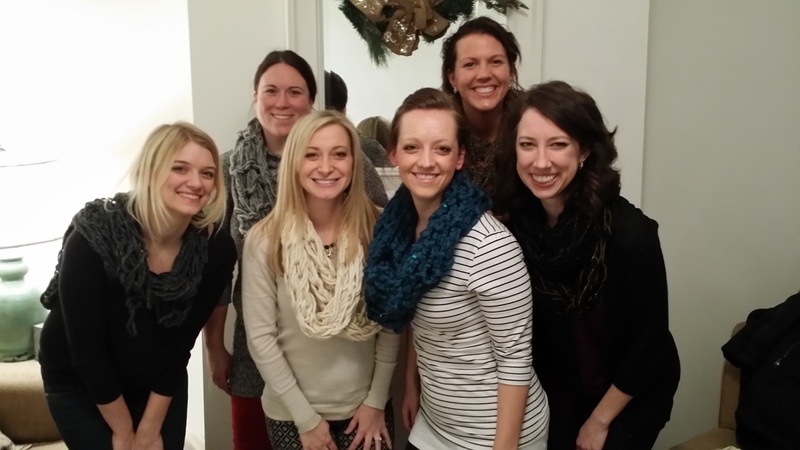 The entire group (Jenna and Dani, we’re looking at you…) made great scarves. The group learned by watching Vickie’s how-to arm knit video (highly recommended) and by the end of the night (about 45 mins? ), each of us had a lovely, hand-knit scarf. The rockiest parts of the project were getting started, though once we learned how and what to loop and over which hand and when, it all came together. The key, we learned, was all in the yarn. A few strands of super chunky strands made the best scarves. If you’re thinking about arm knitting, go for it! Call up a couple of friends and learn together. It’s a great wintery night activity to do with a group. The following day, we wore our scarves to the office after making feeble, though sincere promises the night before, “Of course I’ll wear mine if you wear yours!” Coworkers complimented and boys belittled and we were proud. We, the women of DSG, had conquered arm knitting!